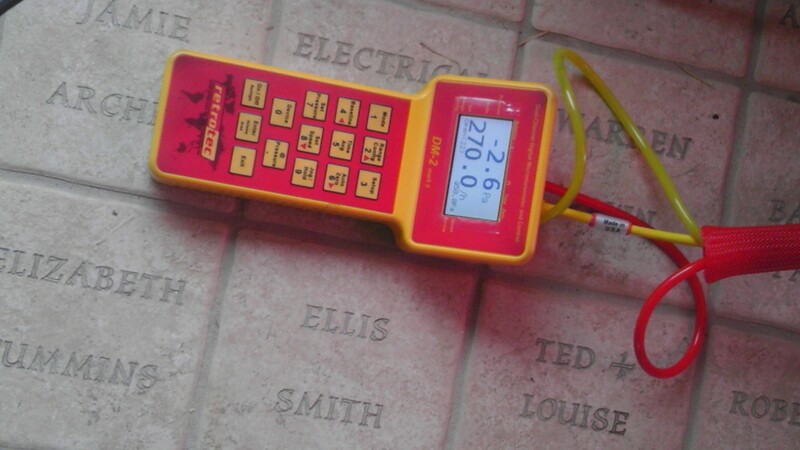 A class act blower test was conducted in the 2002 Solar House. The demonstration was put on by the ArchE 372- Residential Renewable Energy Design class. The purpose of this special visit was to teach the students about how a blower test is conducted but then also be able to set up a blower test as part of a case study in the course. 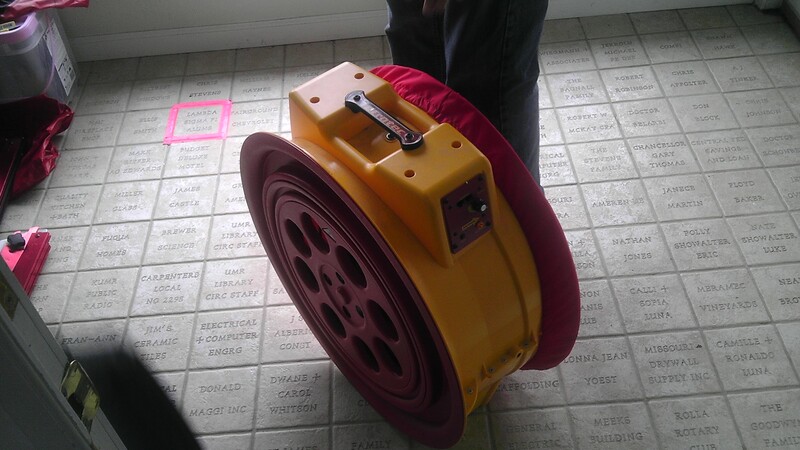 The reason why the students need to learn how to use this apparatus is that it will help them tell homeowners where air leakage is in the home. Air leakage is a big source of wasted energy. It could be a waste with air conditioning or heat because of the fact that systems must work extra hard to keep that stable ideal temperature within the home. Wasted energy equates to wasted money and by conducting this test homeowners face savings all around and create a more comfortable environment at the same time. 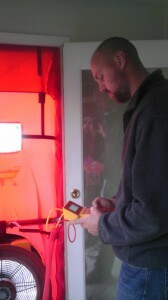 The students used a Retrotec house leakage analysis system. 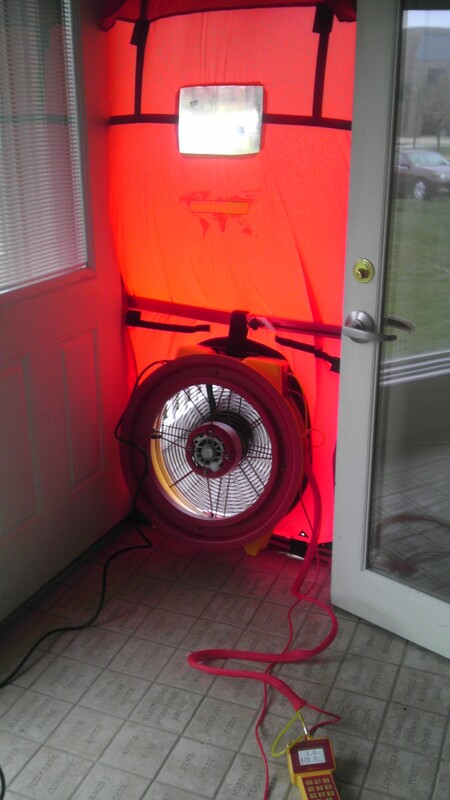 The typical blower door set up consists of a temporary door panel that seals within a door frame. All other doors and windows must be closed when this test is being conducted. A fan within the temporary door is stabilized and is able to measure the airflow. A two-channel gauge that measures pressure helps with calculations. Create a negative pressure on the inside of the home and push the positive to the outside. The pressure imbalance gets measured and can help determine the size of the leak. Fan speeds can be controlled but when everything is set up the fan must be spinning fast for proper results to be read. Soon enough you will feel air seeping into the home from the leak points as its getting sucked in from the outside. The 2002 home had a lot of air leakage around the seams of the door. Standing in the house while this test was occurring students could physically feel the drafts of air. The weather stripping had aged and worn down too much but thanks to this test, more energy awareness has been made. To immediately resolve this energy loss and leakage problem the students made some adjustments. At the same time as running the test they applied duct tape and tissue to line up the door. Immediately, results could be seen on the measurements of the gauge towards a positive direction. The students recommended that once a year homeowners check the weather stripping around doors and windows. There are nice seals that can be used but when in a pinch, tape works to seal off a door. Another method along with rolling up a towel and laying it along the bottom crack of the door is to caulk any stationary house components like window frames. Keeping up on energy savings leads to a happy eco-friendly home!!!!! Retrotec blower system ready to be unrolled!! Shayne Heskin working hard to learn how to conduct a Blower Test!! Close up photo of gauge being used in 2002 solar house.